Subbanna Ayyappan has recently returned from a trip to one of the farthest outposts of his vast empire. He flew to Guwahati, from there drove to Tezpur and then to Dirang in Arunachal Pradesh, where the National Research Centre on Yak is located. The last lap was a tortuous climb to Nyukmadung at an altitude of 2,750 metres where the Dirang centre has its yak farm. Ayyappan, director general of the Indian Council of Agricultural Research (ICAR), confesses he was “a little out of breath” during the last stretch of the journey. The Dirang centre is engaged in making sure the yak numbers do not decline and it is illustrative of ICAR’s mandate. Practically every farm animal, from the mithun, the unique bovine species of the Northeast, to the pig has been accorded its own research centre or a project directorate, like every crop from litchi to sorghum. It all adds up to 98 institutes of one kind or the other, institutes that have been set up or were subsumed by ICAR after it was given control over all research institutes under the Ministry of Agriculture in 1966. 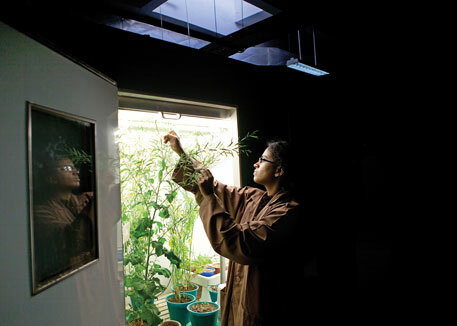 As a result, ICAR boasts one of the largest national agricultural systems in the world, if not the largest. As the apex organisation for coordinating education and managing research and its application in agriculture, agro-forestry, animal husbandry, fisheries and allied sciences, the council has an exhaustive and curious collection of institutes and project directorates dedicated to the study of such things as foot-and-mouth disease and weed science. In addition to 95 research institutes, ICAR funds and oversees some 56 state agricultural universities (SAUs), apart from four deemed universities and one Central Agricultural University for the north-eastern region. Together these constitute the national agriculture research system or NARS. It is a huge enterprise involving some 24,000 scientists, of whom close to 4,800 are with ICAR institutes and directorates; the rest are with the universities. It is a research establishment that dwarfs the number of laboratories its counterpart in industrial research, the Council of Scientific and Industrial Research, boasts. What has all this contributed to India’s agriculture? The typical response of the ICAR top brass is to reel off a long list of successes that focuses on the improved crop varieties that have led to greater food security in the country, the jump in production of vegetables, eggs and milk. Rice and wheat, predictably, are the starred items in this report card, with the Pusa Basmati varieties topping the list. Critics tend to dismiss this as “repetitive and ritualistic applied research” but the ICAR chief insists the increase in food production from 50 million tonnes in 1950 to the current 259 million tonnes has to be seen as the “most beneficial contribution of R&D not just in the form of improved food security but in total factor productivity”. The fact of the matter is that ICAR has no choice in this matter. “Cereals are a high-volume, low-value commodity. We have been mandated with researching these and we are doing it. They are the basics for food security in the country,” explains Ayyappan. 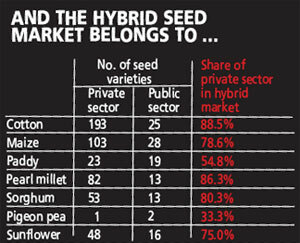 In sum, development of crop varieties (open pollinated seed that can be reused) is left to the public research system, while private companies focus on hybrids (see charts), which is where the money is to be made since hybrids have to be bought afresh for each sowing. Ayyappan is from the Agriculture Research Service, a special cadre of scientists created in 1973, and has been with ICAR for close to 35 years. This true blue product of NARS has made history of sorts by becoming the first non-crop scientist—he is a fisheries expert—to head this sprawling network. That is something he takes pride in, but his tenure has come at a time when agricultural science in the country is battling serious problems of relevance and integrity. That episode involving research of over 10 years to create a public sector Bt or genetically modified (GM) cotton was supposed to herald India’s entry into the hi-tech league. 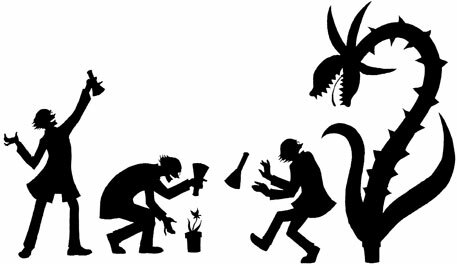 But soon after its commercial release in 2009 there was gloom in the scientific establishment. India’s “completely indigenous Bt variety”, the Bikaneri Narma (BN Bt), failed and was withdrawn after one season. In fact, it turned out no gene, as claimed, had been developed by the public research project, launched under the World Bank-funded National Agricultural Technology Project (NATP) that pumped $200 million into NARS along with a grant of $50 million from the Indian government. India’s foray into GM crop research appears to have gone nowhere. The tragedy is that the research bungling, to put a kinder inference on this discreditable episode, was investigated only after unseemly details about the cotton project were made public by some rival scientists who had filed right to information (RTI) petitions on the project and leaked the details to the media. That no action has been taken more than one-and-a-half years after the fraud came to light has resulted in a deep sense of betrayal and a deepening sense of cynicism among young scientists (see ‘Lies, exposes and cover-ups’,). But the scandals are just part of the problem. Many see NARS as a sclerotic organisation incapable of undertaking the research challenges before the country. A reason for this can be found in the way ICAR functions. The director general functions concurrently as secretary to the Department of Agriculture Research and Education of the Ministry of Agriculture. The post was created in 1974, ostensibly to smooth the interface of the autonomous ICAR with the policy-makers in Delhi’s Krishi Bhavan, ministry headquarters. But this has created an anomalous situation for ICAR, which although set up as a registered society functions as an adjunct of the government. Ramanjaneyulu took the plunge and set up the Centre for Sustainable Agriculture in Hyderabad which works with farmers. Interestingly, the issue of farmers’ suicides, which has now crossed a mind-numbing figure of 285,000, has never figured in any discussion in ICAR nor in any of the SAUs. Nor have they researched the agro-ecological approaches tried by farmers who are tired of the unsustainable nature of the heavily input-driven model of farming promoted by NARS, laments the scientist. The fact is that none of these models, even the non-pesticide management method that has spread across Andhra Pradesh, has been studied in detail by ICAR, although its own assessment reports show that such models bring in ecological and economic benefit to farmers. “Now several of us working in and outside NARS are forming a professional society to publish a peer reviewed journal on agro-ecology,” he says. This, says an old-time scientist, is “a complete turnaround by the state”, which had itself encouraged such research and promoted policies that have focused almost entirely on increasing cereal production (rice and wheat, in particular) and provided subsidies that have degraded the environment to an alarming degree. And the twelfth plan approach paper is even more critical. It says: “Public sector technology generation often fails to take into account farmers’ needs, perceptions and location specific conditions for each crop, leading to significant gaps between the varieties released by public sector institutions and the number of varieties actually used by the farmers. Private sector research and the seed industry often focus on those crops and varieties which have adequate scale (massive markets) and scope (repeated sales). As a result, some crops/crop groups get little research attention. This phenomenon is most visible in predominantly rainfed crops like pulses and some oilseeds, which are in crying need for a technological breakthrough.” The irony, though, is that the Centre is again perpetuating the mistakes of the Green Revolution by transplanting the same policies in the eastern region. How NARS will meet the coming challenges is a tough question. Years of repetitive research and a fossilised syllabus in SAUs have cramped the system’s ability to be nimble. One crippling deficiency is shortage of scientists and a marked lack of specialisation in critical disciplines such as genomics. The sanctioned strength for scientists is 6,470; as of last year 4,745 posts had been filled. According to ICAR sources, at any given time 30 per cent of the posts remain vacant. But above all is the question of funds. While ICAR’s R&D budget has increased from Rs 1,760 crore in 2009-10 to Rs 3,415 crore for the current year, there is huge disappointment with the funds allocated by the government for the twelfth plan. 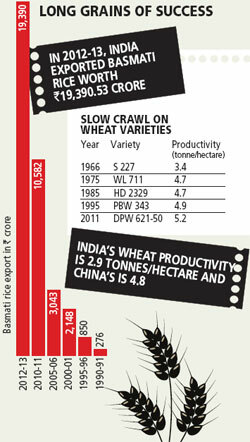 “Everybody knows that our budget is very small,” says Swapan Kumar Datta, deputy director general, crop sciences, ICAR. “In the Twelfth Five Year Plan we demanded Rs 50,000 crore but got only Rs 25,000 crore. That is Rs 25,000 for five years for close to 100 institutions and 56 agri-universities!” Datta, unlike Ayyappan, is a lateral recruit. 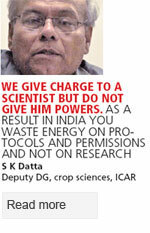 He joined ICAR in 2009 after working for 20 years in institutes in Europe, and he chafes at the bureaucratic controls. The head of crop sciences division is a powerful satrap with 12 national institutes, nine project directorates, three bureaus and two national research centres under his control. In addition, 27 all-India coordinated research projects and India-wide network projects are under his supervision, and in ICAR he is viewed as the man to watch. But as yet he has done little to shake up the system, although he is known to have said openly that “science can’t be done the way we are working”. How this small pie is shared among the many research institutes is also a sore point. The Dirang centre, for one, gets Rs 6 crore per year for the current plan period, not different from what research centres on major crops receive. Likewise, there is little to show that funding is based on the importance of a crop to the farming community. Take what cotton research received in the past 12 years. The plan fund—the allocation for research (contingencies, works, renovation, equipment)—was about Rs 25 crore. External funding from the department of biotechnology, the World Bank’s NATP and its newer avatar National Agriculture Innovation Project (NAIP), added another Rs 6-7 crore. This has given rise to resentment among scientists who question the rationale for allocations. Criteria such as economic importance of the crop, employment potential and emerging challenges should determine budget allocation. Unfortunately, this is not the case. India’s GM cotton revolution has bypassed the public sector, while private companies are raking in huge profits as cotton farmers take almost entirely to the GM hybrids developed by private Indian companies and multinationals. US technology provider Monsanto has harvested a reported Rs 2,000 crore in royalty rates from these firms. In short, the siege mentality has to end. M S Swaminathan, popularly known as the father of India’s Green Revolution, has been associated with national agricultural research system (NARS) since 1947 when he was a student at the Indian Agricultural Research Institute (IARI). After getting PhD from Cambridge University, he joined IARI, of which he became director, and then director general of ICAR. 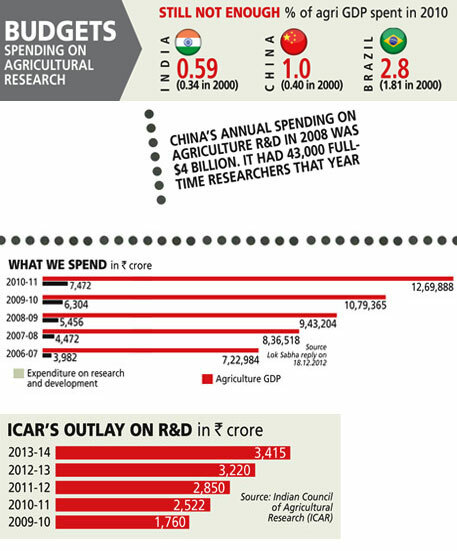 In the Indian Council of Agricultural Research (ICAR) a lot of research is just hearsay. Some of it is imaginary. In some cases very little evidence remains of “significant breakthroughs” that scientists claim to have made. Sometimes scientists leave the organisations, do not hand over the material and no questions are ever asked. At other times, research centres manage to lose the research material. It is all very lax and conveniently so. Some years ago, S K Raina made waves when he was professor at the National Research Centre on Plant Biotechnology (NRCPB). This premier research facility of the Indian Agricultural Research Institute at the Pusa complex in Delhi became the first in the country “to develop an efficient genetic transformation system for elite Indica rice cultivars”. His group was also the first to conduct contained field trials of transgenic Bt Rice in 1999, according to his profile on the Indian National Science Academy website. In 2004, Raina sought voluntary retirement from NRCPB to join a private seed company, Nath Group at Aurangabad, that offers Bt cotton technology. If you ask NRCPB about what happened to the Bt rice they have no answer. Other curious instances of scientific breakthroughs also involve the NRCPB, which appears to be an extremely lax organisation. In October 2011 when principal scientist K C Bansal left the centre to become director of India’s gene bank, he appears to have forgotten to hand over the research materials he had been working on: seed of GM mustard, slow ripening tomato and chloroplast transformed mustard. The then project director of NRCPB P Ananda Kumar wrote several letters to Bansal about the missing material and finally to his boss Swapan Kumar Datta, deputy director general (crop sciences) of ICAR. Ananda Kumar complained that Bansal’s failure to hand over the project files and provide genes, clones, sequences, etc had caused problems while reporting to promoters of the three externally funded projects: the Department of Biotechnology (DBT) of the Ministry of Science and Technology, the World Bank’s National Agriculture Innovation Project and the Network Project on Transgenic Crops. 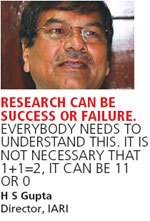 Bansal’s portfolio of research breakthroughs is impressive. Listed by him are transgenic tomato developed with improved tolerance to drought and cold stress; transgenic mustard; transgenic wheat; transgenic tomato with delayed fruit ripening; transgenic mustard with Zat12 and Dhsp genes and transgenic tomato with improved texture. However, there is no sign of these in the research pipeline and Bansal has not responded to Down To Earth (DTE) queries on the current status of the projects. There are also the contretemps over the scientist’s application for a patent for his breakthrough on plastid transformation in brinjal. In December 2012, ICAR began a formal investigation of charges that Bansal had made false claim about a patent application for the transgenic brinjal having been filed in 2007. Based on this and two other patent claims, Bansal was awarded ICAR’s top prize, the Rafi Ahmed Kidwai Award for 2007-2008. However, investigations showed that although two patent applications had, indeed, been filed, no application relating to the transgenic brinjal patent had been made till July 16, 2009, when he was given the award. ICAR director general S Ayyappan told DTE inquiries are still under way. Ironically, Ananda Kumar’s involvement in the GM cotton fraud was investigated by a committee but no action has been taken on its report. “We are still waiting for responses from the parties,” says Ayyappan. All of this has left a trail of unanswered questions—and deepening cynicism among younger scientists about the lack of accountability in the system. ICAR systems, unlike those in CSIR (Council of Scientific and Industrial Research) and DBT, leave a lot to be desired. For one, its research institutes do not maintain the laboratory file. Instead, it swears by the Research Project File (RPF). The difference between the two is this: while the RPF is a dossier on a project, it does not have the detailed day-to-day notings of what transpires in the laboratory or field as the lab file does. “We were shocked to learn about this omission in 2009,” says Rajeswari Raina, principal scientist with the National Institute of Science, Technology and Development Studies. She was part of the team put together by the Knowledge Commission of India to suggest measures to tackle the crisis in agriculture research. In a letter sent to the prime minister and the agriculture minister, commission chairperson Sam Pitroda had made a pointed reference to the lab file while listing steps to improve the organisation of agricultural research. “The Research Project File (RPF) system in ICAR institutes has fossilised and does not assist the conduct or management of relevant research. The lab/project file must be made mandatory in SAUs (state agriculture universities) and ICAR institutes and computerised on a priority basis, preferably by 2009-2010. This will enable the creation of a research database within the organisation and at the national level,” he had said. Based on this lab/project file system, there should be an annual scientific audit of each programme/project. The lab file is yet to be made mandatory and the old ways of keeping an RPF continue in ICAR. Says one cynical young scientist who has worked as an assistant on a transgenic project: “I have found senior scientist manipulating inconvenient data on field trials. If you keep a lab file which has to be signed every day this kind of manipulation is not possible.” However, increasingly, scientists who wish to be published in reputed journals abroad find that such detailed data records have to be provided before research papers are accepted. Plagiarism is the other hallmark of Indian science. Sometimes entire papers have been reproduced, at other times, the crucial parts. These instances, exposed usually by fellow scientists, are dealt with in ad-hoc fashion. Then there are retractions. A recent change in a vector map was made almost 12 years after the paper was published and could undo the original thesis. One suggestion for weeding out bogus claims on research comes from a project director who has had a long experience of handling young teams. Since awards, incentives and career promotions are given to scientists based on applications, he suggests a change of approach. “It is ambitious scientists who apply for these awards and manage to get them. The genuine ones are rarely recognised. To overcome this, the top management of different divisions should identify outstanding scientists for awards or additional increments and promotions without them having to ask.” Assessment could be based on impact of the outstanding research publications, varieties released, production strategies, patents granted, technologies commercialised and novel methods. “This can set up a system that motivates excellence,” the project director says. Many scientists complain that corruption is rampant in the system and that many heads of laboratories are facing vigilance investigations. But this is a problem that cuts both ways. 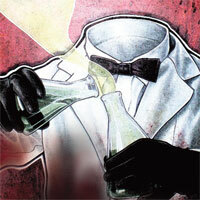 Sometimes, scientists are penalised on seemingly flimsy grounds, such as travelling abroad without the necessary permissions. Datta of ICAR has another take on this. He says, “Our trust system is weak.” There is too much paper work and too many bureaucratic processes, says the scientist who worked abroad for 20 years. “In Switzerland, I would just email my boss and get his go-ahead to go on a trip. That allows you to spend all your time on research and work. Here scientists spend so much time getting clearances and orders from different ministries.” He rues the absence of a robust system that allows scientists to work according to strict principles and regulations. In Switzerland, for example, everybody retires at 60 and nobody gets extension. But in India, even in their 70s scientists hold on to office irrespective of their physical fitness, competence and capability. “This flexibility could make you corrupt. Why should we encourage this?” Datta asks. According to him it is a lovely racket since most of it is on technical material and there is no one to question it. On the other hand, scientists complain that the system is fixed and one is forced to accept the lowest quotation no matter how inferior the quality of equipment and how seriously it could impair research. “We worry all the time about vigilance inquiries, RTI queries and departmental probes,” says Datta. Little wonder that so little science gets done in the system. OF the many odd decisions taken by ICAR chiefs that reveal the unscientific tendencies of its bosses one relates to the National Bureau of Agriculturally Important Microorganisms (NBAIM). It is a story that senior scientists recount with sardonic humour. NBAIM was set up in 2001 at an estimated cost of Rs 5.33 crore by the Department of Agricultural Research and Education (DARE) under the Ministry of Agriculture in the Ninth Five Year Plan. The basic goal of the bureau is to promote and coordinate systematic research on microorganisms that would improve agricultural productivity. 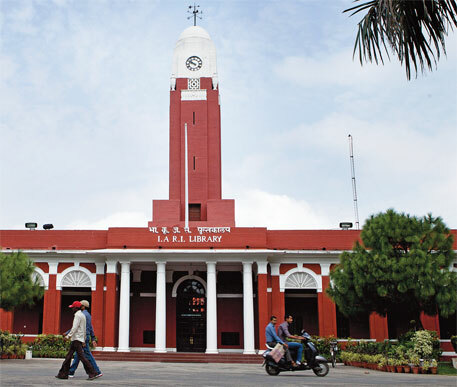 It started functioning on the old premises of the National Bureau of Plant Genetic Resources (NBPGR) in the Pusa complex, Delhi, and was all set to expand its infrastructure when the then director general of ICAR decided to shift it to a location that its staff had a tough time locating on the map: Mau Nath Bhanjan in Uttar Pradesh. It appears that the then DG was from those parts. Accordingly, in 2004, NBAIM was relocated in a building vacated by the National Institute of Sugarcane and Sugar Technology (NISST) at Kushmaur village, which is 12 km from the town and devoid of public transport. The only way to reach NBAIM is through hired taxis. Mau Nath Bhanjan itself is about 120 km from Varanasi. In this remote fastness two dozen scientists and technical staff have put together a microbial collection that the Biodiversity Authority of India recognises as a national repository. NBAIM’s mandate is to act as “the nodal institute at national level for acquisition and management of indigenous and exotic microbial genetic resources for food and agriculture, and to carry out related research and human resource development, for sustainable growth of agriculture”. The location would not have mattered too much but for one crucial factor. There is no power in this particular backwoods of Uttar Pradesh. The bureau requires high quality power to maintain its culture collection: at minus 80 degrees centigrade for long-term preservation, and at 4 degrees C for short-term storage. So NBAIM runs on huge generators to conserve its rare collection and its power bill is whopping. Scientists here say that the use of generators would in all probability be ruining much of the equipment at the repository which preserves and conserves the microbial diversity of the country. The collection has a wide diversity of fungi, including more than 700 species belonging to 250 genera apart from bacterial collection of more than 100 species belonging to 35 genera. The irony is that given the operational constraints, NBAIM may be forced to return to Delhi. In September last year, a regional meeting of ICAR held in Patna decided to send a duplicate set of the microbial cultures to be maintained at NBPGR so that collection remained safe. Right now there is a vigilance inquiry over corruption charges at the bureau. Pretty well covered. It is perfect example of how a system which looks near perfect on paper fails almost completely to deliver at ground. Just to add, agriculture is pretty much a local affair and hence research in agriculture should also focus on local needs and conditions. Even adaptation of simple technology like a new tillage equipment would require proper analysis of soil type, what farmers potentially want to grow and how much they can spend on it. And that's where we fail. Our academic research is too inspired by what is being done in developed countries. For example when we need simple technologies to minimize post harvest losses, our scientists are busy working on things like 'High Pressure Processing'. This approach helps in publishing papers but fails to deliver at ground. Very bold and open article exposing the missing link between Farmers and AgriculturalResearchers and Extension People. No doubt we have one of the chain of best laboratories under ICAR and some of the best scientists in the world. How is it that agriculture has become a part time as opposed to prestigious occupation earlier. 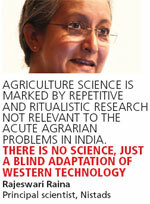 The agricultural scientists are not aware of the needs of the farmers. I myself identified many problems and addressed them to all leading laboratories under ICAR since 4 decades. Many a times not even an acknowledgement. We can learn many things from China,Taiwan,Korea etc. Development experiences of the last decades have shown that human resources development is essential for food security and market integration. Achieving sustainable agricultural development is less based on material inputs (e.g. seeds and fertilizer) than on the people involved in their use. This focus on human resources calls for increased knowledge and information sharing about food production. New agricultural technologies are generated by research institutes, universities, private companies, and by the farmers themselves. Agricultural extension services are expected to disseminate them among their clients, but due to poor linkages between research and extension the adoption of new agricultural technologies by farmers in the developing world is often very slow and research is not focussing on the actual needs of farmers. In many countries the insufficient agricultural development has been attributed, among other factors, to poor linkages between Research-Extension-Farmers and to ineffective technology delivery systems, including poor information packaging and lack of communication systems. MODERNISE THE TRADITIONAL Ã”Ã‡Ã´ TRADITIONALISE THE MODERN. It is unfortunate that the article mentions "Ironically, Ananda KumarÃ”Ã‡Ã–s involvement in the GM cotton fraud was investigated by a committee---". It appears that the authors of the article have not carefully read the Expert Committee Report which was placed in the ICAR website. The report only says about my involvement on Page 9 as "On his part the PI did not perform the duties of overall coordination, monitoring and filling in the gaps that are normally expected of the PI". It cannot be labelled as fraud. I was overall PI of the project that had seven components each of which was handled by an independent PI. Bt-Cotton was worked upon at UAS, Dharwad and CICR, Nagpur but not at NRCPB. In addition, the project operated from 1999 to 2004 when my involvement ended. Problems related to the contamination and other issues cropped up from 200 5 onwards, which were thoroughly investigated by the committee. More or less on these lines I presented an article [Chapter in a book titled "Current Environmental Issues" published in 2003 by Madhu Publications, Bikaner] titled "Evolution of Seed Technology, Biotechnology" pages 139-158. From Dr. M. S. Swaminathan as DG onwards most of the DGs are not looked at farmer and his socio-economics or food security or nutrition secusity aspects. They are mostly looking at commercial interests -- businessmen interests. 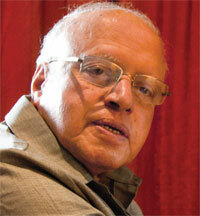 Dr. M. S. Swaminathan appears has changed his priorities now a days!!! Still Indian farmers are looking at "Rain God" as around 60% is rainfed. 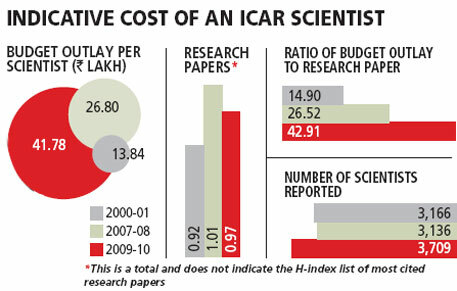 The research institutions neglected this area -- government & ICAR. They are looking at increasing yield per hectare under chemical inputs & irrigation at huge costs. Yet, they are least bothered on the quality of fodder, which in affect reduced drastically the animal husbandry component. Thus, this system severely affected the environment and farmers security. Under traditional mixed cropping fodder helped the animal husbandry that was part of socio-economic-food security - nutrition security of farming community as well rural population. Even with so much thrust on chemical inputs technology, our research institutes failed to build the gap between Research farm yields and farmers field. Intially to push the technology, the research institutions inflated the yields but they never achieved this in farmers fields. Thus, cost of production gone up multifold level. Research priorities are not looking at farmer but looking at Western MNCs to meet their greed. Though progressive farmers showed the path how to increase yield and quality of food & fodder -- they received national and international recognition -- the government failed to encourage such inventions through stabilizing & through extension services. 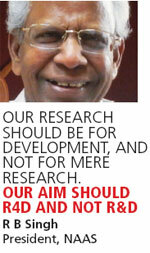 Many research institutes including CRIDA, ICRISAT, etc, bent on survival research. They brought in new concept of climate change resilliance a time pass research to get promotions through number of trash publications. The main issue here is that we need an institution free from political bungling and research priorities must be farmer oriented rather than business oriented and then only farmer as well country show progress in agriculture. Our agriculture institutions must change??? I find the title of this article a bit alarmist, yes there are bad apples in the ICAR basket of scientists, but there are some very good ones as well, some scientists are doing excellent work at par with the global mainstream. There are a few scientists whose misdemeanor have brought bad name to ICAR, but it would be unfair to paint entire ICAR with the colour of these few individuals, in the media you find the misdeeds of the "same" set of people over and over again. Where top management of ICAR has failed, is to take stern action against these people so that it may act as a deterrent for other people to indulge in such activities and restore some good faith back in ICAR. One more thing Agricultural Research is not just about Biotechnology, yes it might be the in thing, but it is not the only thing, there are so many area in agriculture where research is going on and many unsung heroes are doing an appreciable job. Though it is true that ICAR has huge scope for improvement but it is not doing a very bad job considering the kind of inputs it gets, one must understand ICAR is not a factory, where you can calculate the ROI and profitability by doing an analysis of revenue and cost. Research is an ongoing activity which may or may not always lead to path breaking discoveries. India contributes to the CG fund and in the CG system an IRS is paid 5 - 8 times the salary that people in ICAR are paid, hence if at all the argument is made that india spends too much on Agricultural Scientists, they first should say India should stop contributing to the CG fund as there the cost per scientist is several folds higher. Another aspect which must be factored in is that ICAR is a public institution. And it is one harsh reality in india that Public sector institutions are not merely viewed as agencies to carry out a specific task but also an avenue for achieving social security and affirmative action through employment, these considerations also affect the system which prospers only with meritocracy. I believe affirmative action is necessary in society and so is representation of every class and caste in the administration of Indian State, but this is one area which should be purely skill based. The quality of scientists in ICAR is a reflection of honesty and competence in ASRB, in the last few years, that area has seen a decline. Political, Cronyism, Favouritism, Casteism and Regionalism based considerations seem to have led to this decline. The rot at the top has a trickledown effect. The feeling that only people who have connections with politicians and bureaucrats in krishi bhavan can get promoted and assume leadership roles in ICAR is very prevalent. It is widely believed that there is cronyism involved in certain selections as well. When a young ARS enters the system they are full of idealism, once they enter and see what really counts to climb up the ladder they tend to get diverted towards civil services and waste their initial years preparing for UPSC. Another which is prevalent not just in ICAR but across research establishments in India is craze for administrative positions, heads, directors, VCs no matter how useless and intellectually bankrupt they are, are treated as gods. This kind of feudal mindset should be changed. Here the role of leadership is critical, the DG, DDGs etc should back their best brains. The leaders in these roles should have the pragmatism and vision to know how to get things done, they should identify the scientist who really have the intent to perform and give them full support and reduce the extent of red tapism that they have to face while working. I have been a close observer of the ICAR and in my opinion the current top leadership of ICAR has some decent people with good intentions, I guess if they could be a bit more assertive they would be able to restore some glory to ICAR. Strong leadership does make a lot of difference. In the end I would just like to say that the silent majority is doing a great job in ICAR. A few one off incident should not be generalized to say that entire Science is under siege, there are deficiencies in the system, but then every system has some of them, even corporate agencies have them. You have made very good suggestion, liked reading it... until i found that you too have copied large texts from other sources...plagiarism seems to have totally engrossed you!! 2. Written test with enough check and aptitude test for the desired post and promotions. 3. Full decentralization, only control for administration by the superiors. 4. Scientist should be free to send the research proposals to any funding organizations, without so called forwarding by the superiors. 5. The data about the tours and foreign assignment should be openly disclosed and their output too. 6. There should not be any age bar or even subject bar for the promotions, filtered by written exam. 7. Head of the divisions should be rotation based. 8. Students guidance should also be decentralized and lying with the guide. 10. The scoring system is fully based on the seniors, not a single points, where scientist can earn independently. It should be abolished at all. is agricultural research and industrial research comparable? inbreds and repetitive research become jargon words for some of the peoples, I am listening these word since i was student. What is required for family ? Self policing is enough to achieve better tomorrow. Think a little,Start a little,Spend a little,Grow a little land up in infinity. ICAR has helped in increasing the food production by launching high yielding varieties during 1970s. Food security was the major issue that time. Our country could produce food to feed its population. This was possible because of technology, technology transfer mechanisms, policies, etc. All the concerned ministries of India played their roles under the leadership of policy makers. Today the situation has changed. The question to sustain of the technology in the green revolution belt has emerged. The effort to extend the green revolution to eastern parts of the country is envisioned. Post harvest technology is getting more importance considering the losses in the supply chain. There is a threat to the climate. Horticulture, livestock and fisheries need to be promoted further. For all such efforts need a change in the mindset of the policy makers, researchers and extension professional. Today the Extension Professional are with biology background, though the Extension Education is an Applied Social Science. The social issues, like Community Organization of small farmers in the forms of SHGs, Cooperative Societies, Producer Companies, Participatory Approaches, Partnership Approaches, Micro Finance, Marketing Co-management, etc. are becoming more important than than Transfer of Technology methods, like Demonstration, Exposure Visits and Training on technologies. For such social issues the Departments of Agriculture, Livestock and Fisheries do not have specialized persons. ICAR systems too do not have such scientists. Even if they are there they are in small numbers, mostly busy in organizing technical training, advisory services and exhibitions. Should we not introspect and refine the system so that it addresses the current issues more effectively? This feature is not about the Ã”Ã‡Ã¿misdemeanoursÃ”Ã‡Ã– of a few scientists but about the failure of the system as a whole to address the agrarian crisis. As you very correctly point out, there are a few bad apples in every system. That is not the central point here. My question is why has ICAR with its well-paid scientists failed to understand what is happening in the fields? What has NARS done for dryland agriculture, for the huge majority of our farmers who make their living from rainfed lands? Has there been any introspection on why so many of our farmers take their own their lives? The death of locally relevant research was hastened by centralised command and control system of ICAR in the late 1960s. Ironically, this was reinforced after an inquiry committee looked into the reasons for the suicide of an IARI scientist in 1972 who was protesting against the inequities of the system. Nor has ICAR encouraged SAUs to pursue research on problems afflicting their agro-ecological zones. There is a worrying degree of defensiveness and perhaps complacency in claiming that Ã”Ã‡Â£the silent majority is doing a great job in ICARÃ”Ã‡Ã˜. Perhaps, they are. Does it translate into anything useful for the farmers? If, indeed, Ã”Ã‡Â£ many unsung heroes are doing an appreciable jobÃ”Ã‡Ã˜ then surely the results would be there for all to see? However, I do agree entirely with you when you say agriculture research is not just about biotechnology. That, in fact, is a major problem with some ICAR bosses who focus all their energy on railing against the regulatory curbs placed on GM field trials as if there was nothing else to be done in NARS. The shrinking share of ICAR in major crops (pulses, oilseeds, and now cereals) tells its own story. My aim was to spur scientists to take pride in the discovery of new knowledge and to fight for an environment conducive to this. In kerala, we are suffering from a coconut disease called "Kaatruveezcha".Nothing has been done by the coconut scientists to eradicate the disease.The disease is prevailing since my childhood.Often they show in Amrita TV that a scientist from Kasaragod has identified the organism.Then another day a scientist from USA reports in leading Indian newspapers that all works done are fraud.We, Kerala people are confused who is speaking the truth.Even the current investigative magazine of this article Down to earth reported in 2009-10 that a scientist had made a breakthrough in identifying the pathogen of "Katruveezcha".We are confused who is speaking the truth.I think the general public has the right to know the truths of the scientific investigations as we are funding it.Will Down to Earth will come out with an investigative report on the truths of the "Katruveezcha" research findings. Indeed a timely and eyeopener to the root cause of crises in the agrarian sector. ICAR history is witness to this humongous expenditure pattern as well as 'no results' syndrome. The flagship programmes of the ministry, namely RKVY, NFSM as also a set of other seven mission modes and ATMA is a clear vindication of this wasteful expenditure that is far removed from the grassroots reralities. This rashtriya kosh se vyarth-vyaya yojana is a 'made in krishi-bhawan' programme that is remotely controlled by a cartel of babus and nodding-scientists in ICAR [http://alturl.com/opaxu]. PM in his 83rd ICAR foundation day lecture in 2010 exhorted these scientists to get their research from their one and only client, namely farmers. And how did these scientists respond? By passing a resolution at their conclave http://alturl.com/ev79z completely outwitting PMs pleadings and advice. Hence PM proposes agricultural scientists disposes. The main reason for ICARs disinterest can be judged from the scientists conclave held in February 2013 at Bhubaneshwar http://alturl.com/ev79z. Obviously the agenda setting for national research is done elsewhere beyond the borders in which UN bodies are accomplices. The ICAR and NAAS needs to take these issues raised in the piece more seriously and are answerable to the farmers in this country. During one of the agricultural scientists meet a couple of years ago I was surprised to find blank faces when a simple question of utility of these research to the 120+ million MARGINAL+SMALL farmers was posed for reflection.When agricultural scientists dare to dispose of country's PMs pleadings to get their research from farmers and is so easily ignored the task indeed of transforming the systemic ills is daunting but not impossible. A sure shot remedy for a positive change certainly lies with the young students in the colleges training to be agricultural scientists. Hope they do get to read this incisive essay and make serious engagements both formally and informally. They are comparable like faceless entities of ANONYMOUS! First of all I applaud Down to Earth for producing a wonderful article. After my post graduate in Agriculture, I worked with a fertilizer concern and doing marketing. I was amazed that there is no connection between what was taught and what I saw in field. Private companies were ruling the market, I haven't heard about the pesticides and seeds that are flooding the market while studying. The syllabus is fossilized, the research's are repetitive and ritualized as rightly mentioned in the article. There is not even a little bit of concern for farmers among the scientists. They are well paid, concerned about their own honors, promotion and status in the society. They just see it as a lucrative job with no commitment. Four year of U.G, 2 years in P.G and 4 yrs of Ph.d and clearing ARS exam makes one a scientist. A dramatic change is needed in research. The syllabus has to be changed first and the recruitment method must be changed. Those with flair for research and real concern for farmers should be identified. Shifting research to farmers field must be the priority. Above all there should be accountability. There are many examples of farmers who are doing their own research without any theoretical knowledge and had made their research successful. Farmers field schools, farm schools, Athma scheme by the central government are not going to work until our Agricultural scientists start working with farmers. It is not the failure of extension system alone. It is complete failure of agricultural scientists to understand the need of the farmers. Localized research, on farm field trials with participation of farmers should be the priority. Ask scientist to come out of the campus and work with villagers. A very thought provoking article and comments related to our public institution working in agricultural research. ""In Haiti, the protests are larger and the stakes are higher. After the catastrophic Port au Prince earthquake in 2010, 10,000 Haitian farmers marched to reject a $4 million donation of seeds from Monsanto, arguing that the company was trying to hook peasants on seeds they couldnÃ”Ã‡Ã–t share or replant. In a dramatic show of defiance in the face of widespread hunger, the farmers publicly burned the seeds. They argued that people have the right to food and the right to choose where their food comes from and whatÃ”Ã‡Ã–s in it. This call to Ã”Ã‡Â£democratize the food systemÃ”Ã‡Ã˜ got no hearing at the World Food Prize. Who came first on that list, and who came last, was lost on most of the crowd."" There has been an error with regard to Fig. 1. The orientation of ICP gene cassette is given from EcoRI to HindIII where it should be from HindIII to EcoRI. This error is deeply regretted. The correct map of T-DNA is given below. Fig. 1. T-DNA of plant transformation vector pBinBt3 carrying the ICP gene, cry1Ac; nptII, neomycin phosphotransferase II; LB, left border; RB, Right border; pAnos: Poly(A) sequence of nopaline synthase gene; pAocs: Poly (A) sequence of octopine synthase gene. Corresponding author. National Research Centre on Plant Biotechnology, LBS Building, IARI, PUSA Campus, New Delhi 110 012, India. Tel. : +91 1125848783; fax: +91 1125843984. Copyright â”¬Â® 2012 Elsevier Ltd. All rights reserved. Criticism also needs lot of research. Be a critic, but do your homework first. The article says that contribution of agriculture in India's GDP is going down. I may add that it was 51.9% in 1950-51 when we were dependent on imported wheat and grain production in the country was aaround 50 million tonnes. The decline in GDP contribution of agriculture sector shows development of industry and services in the country. USA is doing very well in agriculture, however the GDP contributed by agriculturein 2011 stands at 1.25% only, for UK it is 0.72% only. This shows that you guys are sensationalizing the whole thing without understanding the real issues. The artaicle is factually wrong and it is merely a product of negative journalism. You have criticized ICAR for neglecting research on Pulses. You may just see the brief on Network project (MULLaRP)to gauge the depth of ICAR's contribution, and there are many other initiatives in this direction. Mungbean, urdbean, lentil, lathyrus, rajmash and fieldpea (MULLaRP) together accounts for about 37 % of total pulse production in India. To give impetus for research on these crops in a coordinated manner at national level, the All India Coordinated Research Project on MULLaRP was established in 1993 under ICAR. The network operates through 26 centers across the country. A history of the agricultural research system would be instructive. Let me reiterate some landmark events (given on Pages 28-29) that you appear to have overlooked. In 1966 when it was re-organised ICAR was given full responsibility to conduct and coordinate agriculture research, breathing fresh life into an organisation that was almost defunct. This was accompanied by a six-fold increase in funding. Then in 1974, ICAR was turned into an even better-funded department of the governments as DARE. This consolidated its central authority and bureaucratic control over research. No one is saying that SAUs are one and all excellent institutions. Indeed, many of them have mediocre faculty and do very little research. But since the 1960s, locally relevant research has not been encouraged and there is no gainsaying the ICAR has stopped SAUs from addressing problems in their ago-ecosystems. I guess we should blame the government for this state of affairs and not ICAR. No doubt that constructive criticism is always good, however the good points, progress made and contribution to the nation can not be just wiped out. Deep research is needed to write on working of organisations of national importance so that things can be put in the right perspective before the public. It is not enough to go for 2 or 3 hurried interviews & compile something without deep study and just paint a dark picture. That does not raise one to the stature of neither a respected analyst nor an activist. For the benefit of readers and your senior editors, I am reproducing some content from Wikipedia, more you may see on the parent site. Per 2010 FAO world agriculture statistics, India is the world's largest producer of many fresh fruits and vegetables, milk, major spices, select fresh meats, select fibrous crops such as jute, several staples such as millets and castor oil seed. India is the second largest producer of wheat and rice, the world's major food staples. India is also the world's second or third largest producer of several dry fruits, agriculture-based textile raw materials, roots and tuber crops, pulses, farmed fish, eggs, coconut, sugarcane and numerous vegetables. India ranked within the world's five largest producers of over 80% of agricultural produce items, including many cash crops such as coffee and cotton, in 2010. India is also one of the world's five largest producers of livestock and poultry meat, with one of the fastest growth rates, as of 2011. One report from 2008 claimed India's population is growing faster than its ability to produce rice and wheat. Other recent studies claim India can easily feed its growing population, plus produce wheat and rice for global exports, if it can reduce food staple spoilage, improve its infrastructure and raise its farm productivity to those achieved by other developing countries such as Brazil and China. In fiscal year ending June 2011, with a normal monsoon season, Indian agriculture accomplished an all-time record production of 85.9 million tonnes of wheat, a 6.4% increase from a year earlier. Rice output in India also hit a new record at 95.3 million tonnes, a 7% increase from the year earlier. Lentils and many other food staples production also increased year over year. Indian farmers, thus produced about 71 kilograms of wheat and 80 kilograms of rice for every member of Indian population in 2011. The per capita supply of rice every year in India is now higher than the per capita consumption of rice every year in Japan. India exported around 2 million metric tonnes of wheat and 2.1 million metric tonnes of rice in 2011 to Africa, Nepal, Bangladesh and other regions around the world. Aquaculture and catch fishery is amongst the fastest growing industries in India. Between 1990 and 2010, Indian fish capture harvest doubled, while aquaculture harvest tripled. In 2008, India was the world's sixth largest producer of marine and freshwater capture fisheries, and the second largest aquaculture farmed fish producer. India exported 600,000 metric tonnes of fish products to nearly half of all the world's countries. India has shown a steady average nationwide annual increase in the kilograms produced per hectare for various agricultural items, over the last 60 years. These gains have come mainly from India's green revolution, improving road and power generation infrastructure, knowledge of gains and reforms. Despite these recent accomplishments, agriculture in India has the potential for major productivity and total output gains, because crop yields in India are still just 30% to 60% of the best sustainable crop yields achievable in the farms of developed as well as other developing countries. Additionally, losses after harvest due to poor infrastructure and unorganised retail cause India to experience some of the highest food losses in the world. the authors of the original papers. Most of them are public bred hybrids or parental lines which were stolen/taken away from the private seed companies and sold them in their brand name. Inspite of better directions from PVPFR authority to deposit and register their varieties/hybrids, none as done. I am very sure, if all the private company sold varities/op's/hybrids were fingerprinted, one could easily assigns their origin to any of the public bred inbreds/varieties/hybrids. these public varieties/hybrids were developed by public institutes like ICAR Institutes/SAU. Anonymous commenter presents/quotes on production related to agriculture and aquaculture. He did not mention at what cost we achieved that growth. This was achieved with subsidized fertilizers. The chemical inputs created air, water, soil and food pollution. The health hazards increased with this and reduced fresh water availability and polluted the meat, milk, fish-prawns, etc. How much is the medical costs to earnings of total population. The chemical inpu technology/GM technology severely affected nutritional security as well food security and farmer's security. Traditional agriculture includes animal husbandry. The diet is healthy one. We apply technology blindly without looking at the consequences of such technologies. Let us go back to traditional technology and improve our lives - health. But the new technology helped multinational companies to mint billions at the cost of human sufferings all over the world and local business-political nexus to mint wealth through export and thus rising prices in local market under poor governance. All along Dr. M. S. Swaminathan talked of green revolution and got awards after awards and now taking of organic agriculture. He talked of GM crops and now talks of no GM crops!!! The Sher-e-Kashmir University of Agriculture Science and Technology (SKUAST) Jammu is likely to get new Vice-Chancellor in next few days as the incumbent is being shown door more than three years ahead of completion of his tenure. The incumbent Dr Dilip Kumar Arora, who took over as the Vice-Chancellor of SKUAST-Jammu in May 2012 for a tenure of five years, is learnt to have submitted his resignation to the Governor. see http://www.dailyexcelsior.com/skuast-j-to-get-new-vc-as-incumbent-being-.Dr D K Arora, who has more than three years of his tenure as the Vice-Chancellor of SKUAST-Jammu, is learnt to have submitted his resignation to the Governor on health grounds. However, sources claimed that health grounds are not the actual reason for the unceremonious exit of the incumbent Vice-Chancellor but the permission seeking prosecution of Dr Arora for the charges established against him during his previous tenure as Director of the ICARÃ”Ã‡Ã–s National Bureau of Agriculturaly Important Micro-organism (NBAIM) in Mau (Uttar Pradesh).